There are two different types of people in this world. There are those who love a sequel and those who hate them. Personally, I’m a fan of sequels in most cases. Are they better than the original? Rarely. Very rarely are they better than the original but if I’m in love enough with the story and the characters, I’m all down for a sequel. This is the case with Andrew Lloyd Webber’s musical Love Never Dies prequel to his 1986 Tony-award winning masterpiece The Phantom of the Opera, which I recently saw at Hennepin Theatre Trust last December (review at the bottom of this page). The musical has been 20 years in the making and finally is on its first North American tour. Even though Webber stated he saw Love Never Dies as a stand-alone piece and not a sequel...it totally is in every sense of the word. Love Never Dies takes place 10 years after the original events that took place in The Phantom of the Opera at the Paris Opera. The year is 1907 and the Phantom, along with Madame and Meg Giry, have found a home at the wonderous Coney Island in the U.S. While he has finally found a home for his music to be appreciated in the lights and frights of the freak shows, his still yearns for his one true love and musical protégé, Christine Daaé. Christine is now married to Raoul and has a 10-year-old son named Gustave. They come to the United States after Oscar Hammerstein invites her to sing at the grand opening of his new Manhattan opera house. The Phantom catches word of this and pledges that he’ll reunite with her by hearing her sing one last time. If you’re a fan of the first, I think it’s an enjoyable evening. As I mentioned before, returning to your favorite characters can be very nostalgic and it felt refreshing to see them again. Almost like greeting old friends. The plot itself has a few twists and turns that I didn’t see but overall the actual story isn’t really that revolutionary. 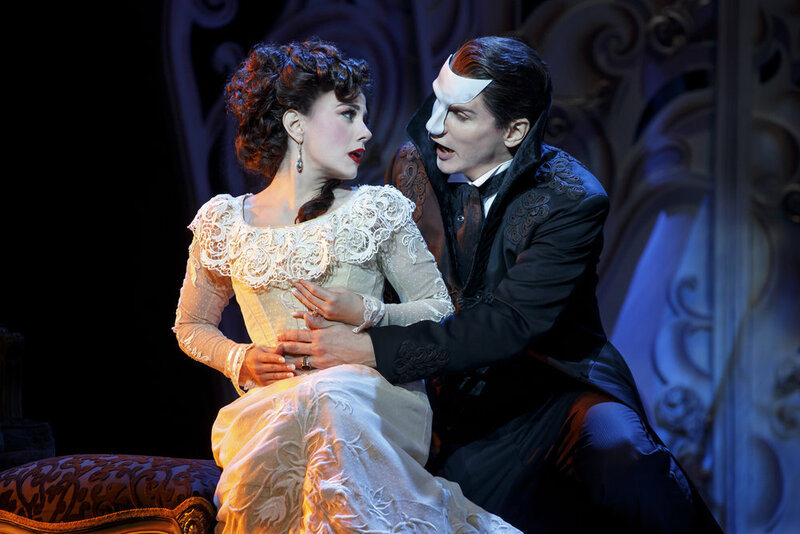 It’s similar to the first in which the Phantom is still madly and obsessively in love with Christine and will do anything to receive her love in return. The only main differences are the location and the fact that she has a son. One thing to note that I think is pretty amazing is the role of Christine despite the time. While it takes place in 1907 , Christine is actually the bread winner and the one who provides for the family. She works while also taking care of her son and I think that's something really special to note. There are a few other moments that I didn’t believe including Meg’s spiraling sanity and the relationship between the Phantom and Raoul. However, what made this stand out for me was the beautiful set design by Gabriela Tylesova and the soaring score and lyrics. The set is something really special that captivated me the entire time. A times it’s reminiscent of the Paris Opera House with beautiful architecture including Christine’s dressing room and the peacock backdrop during her performance near the end of the show. However, it can quickly change to the frights, lights and displays of the carnival that is Coney Island. The set morphs from outside with rollercoasters and freaks to inside the grand tent where they perform. The production uses a rotating section of the stage to reveal more set pieces and hiding places for actors to appear. It was an added element that I think really opened it up more for the performers. I must say it was pretty spectacular and something different we are used to when we think of the world that these characters live in. What the book and plot lacks is made up for in this stunning new score (Webber) and lyrics (Glenn Slater and Charles Hart). It’s a gorgeous score with enchanting lyrics that are, again, nostalgic of The Phantom of the Opera but still holding their own. At times you can catch glimpses and moments of the original music, yes that includes a moment of the Phantom’s original theme as well as classical favorites like Angel of Music. Just when you realize you recognize the tune, it takes a darker and edgier twist with playful carnival styled overlay. The lyrics are also sung beautifully by the entire cast. A few even had me hanging onto every note wanting more. Some of my favorites included Christine’s duet with the Phantom titled Beneath A Moonless Sky. The lyrics are mesmerizing, and I’ve certainly listened to the version on Spotify at least 10 times today alone. Singing Webber is nothing easy. I appreciate his pieces because they are so reminiscent of old time Broadway with crystal clear Sopranos and beautifully rich tenor/baritone singers. This cast nails it. Christine Daaé is played by Meghan Picerno and has one of the most clear and beautiful soperano voices I’ve ever heard. The passion and love can be heard through her voice along with the doubt of the Phantom’s true intentions. The Phantom is played by Bronson Norris Murphy, who is just stepping into the role in Minneapolis. Playing the Phantom is such a hard role for some many reasons. Not only do you need a spectacularly rich and dee voice but getting inside his head is a feature in its own. I think it’s a difficult role to play because of the fine line they must play of being madly in love without coming off too obsessive. Murphy nails this while he holds not only Christine but the entire audience in the palm of his hand. Other notable roles include Raoul, played by Sean Thompson, who has a duet with Phantom titled Devil Take the Hindmost and was another musical highlight of the production. Gustave, who is played by Jake Heston Miller, who has a ridiculous voice for how young he is. At one point he ventures into the dark shadows of Coney Island with the Phantom. Before though he sings the beautiful aria, we hear Christine originally sing at the end of the song The Phantom of the Opera. And yes, he hits those high notes wonderfully. Madame Giry, played by Karen Mason, is sinister and always making the audience question what she really wants. Meg Giry, played by Mary Michael Paterson, is great despite the character lacks a bit in the actual writing. I think they could have given the character a little bit more throughout the show. Love Never Dies is an adventure down memory lane and is a perfect evening for anyone who is a Webber or Phantom fan. The score is beautifully written, and Webber surprised me with what I thought would have been a sub-par rip off of the original. However, I gave it a chance and it paid off because it was truly was a magical evening. As most Hennepin Theatre Trust production, this traveling cast is here for a limited time so don't drag your feet on getting tickets. 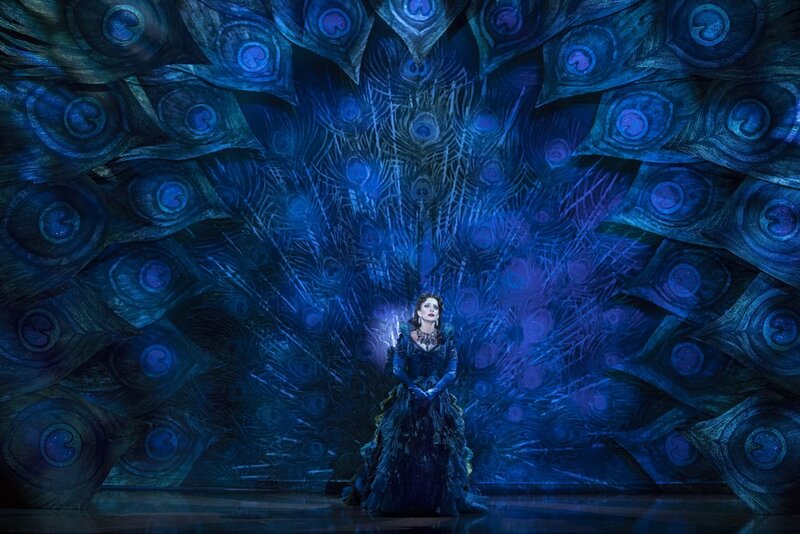 Love Never DIes runs at the historic Orpheum Theater in Downtown Minneapolis through July 1st.